During our team’s recent trip to visit our partners in Dinarte subdistrict of Akre in Iraqi Kurdistan, the team visited three villages Kashkawa, Muruke and Chame Rabate. Most of those who are living there are impacted by bombardments and land occupation. We visited them in order to know more about their life under the Turkish bombardment. When we arrived we were warmly received by Yousif, a villager living in Kashkawa. He had also invited some other villagers and Kashkawa’s village leader. Yousif told us it has been awhile since the last bombardment from Turkey, however they are still affected by it. 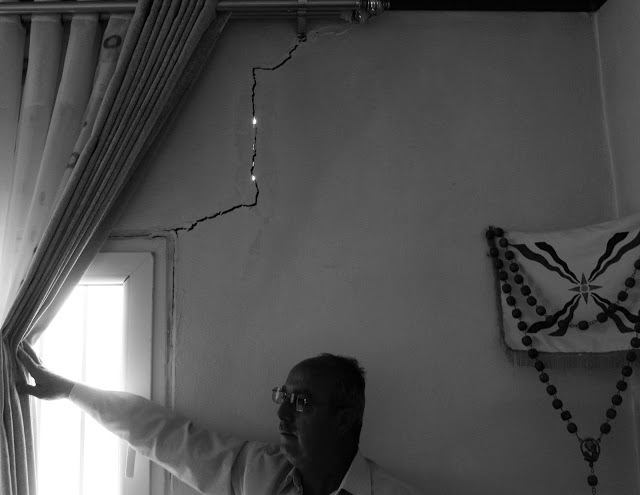 “Our houses are damaged and our children and families are traumatized by the former bombings.” We witnessed holes in the walls of houses and pieces of bombs on the ground. A women who was sitting with us said “we haven’t any guarantee of our safety and life under the Turkish bombings.” We noticed the fear on the faces of children and women, even after three months since the last bombing. While we were listening to them Sliwa Zaya who has come with us from Kashkawa village said “we are living in a jungle because we haven’t any assurance for our life”. The villagers suggested the team visit Chame Rabate village, to hear what had also happened there. We said our goodbyes and drove to Chame Rabate. On our way there we faced difficulty driving, the road to the village was very bad. As we drove we noticed that the roads to villages around that area are unpaved and difficult. When we arrived at the entrance of Chame Rabate we saw three people working on rebuilding destroyed watermill, they told us this is not the first time they are rebuilding it. In the beginning Saddam destroyed it but now Turkey is destroying it . At this moment a man with a tired face, in working clothing and holding an axe in his hand approached us. He was notified that the team is coming to his village. We gave him a lift with us to the village where he guided us to an old church under a beautiful mountain. Beside the graveyard there were women and men standing and sitting. We talked to them about their fears and the damages from Turkish bombing, they showed us pieces of bombs. We noticed the bombardment had been done around the church of the village. We have seen this done by Turkey before around mosques in the Muslim villages in Qandil . The villager showing the team the photo of the man beaten by a commander. Photo by: Kasia Protz. He responded , “He is the man standing beside you now, the village leader ” Then the village leader told us “a commander occupied my own land so I tried to prevent it. However, the commander told me, “I am the government, law and power.” He continued “the commander’s followers beat me and they injured my face badly. He tried to prove that he was powerful himself and I knew why he did it against me. Under my land there is oil.” We then noticed that our young people had documented the events which happened on their mobiles. As the day was ending and it was getting dark we left Chame Rabate village, Sliwa Zaya who was with us during the whole trip through villages, told us more about the Asyrians “we are the native Iraqi people and one of the first to be here.’’ There is nearly 3 million people of us separated around the world. Our language is Asyrian, it came from Aramaic language, which was the international language during the Asyrian empire.